CIR magazine Risk Management Awards 2013 recognise creative thinking and innovation to risk management. The Caribbean Climate Online Risk and Adaptation tooL (CCORAL) has been recognised at a major international risk management awards. CCORAL, a web-based tool designed to help decision makers in the Caribbean integrate climate resilience into their decision making and planning processes, was developed by the Caribbean Community Climate Change Centre with technical support from climate risk consultancy Acclimatise and funding from the Climate and Development Knowledge Network (CDKN). The seminal risk management tool helped the consulting outfit to cop the prestigious ‘Consultancy of the Year’ award at the CIR magazine Risk Management Awards 2013. The award follows a series of successes for CCORAL, which was referred to recently in the Jamaican parliament, with the Minister for Water, Land, Environment and Climate Change, Robert Pickersgill, saying that the tool will be used “to assess the risk of community and national projects against specific climate change scenarios”. The Chairman of the Intergovernmental Panel on Climate Change (IPPC), Dr Rajendra Pachauri has also praised CCORAL saying “The development of the… tool [is] an extremely important asset in assessing the risk from the impacts of climate change in the Caribbean region”. Deputy Director and Science Advisor at the CCCCC Dr Ulric Trotz says CCORAL, which allows for the integration of climate change and a risk ethic into national development planning across sectors, comes as part of a continued effort by Caribbean Community (CARICOM) Heads of Government to strengthen climate adaptation. Last year they approved the 2011-2021 Implementation Plan to operationalise the Regional Framework for Achieving Development Resilient to Climate Change. The Implementation Plan was also designed by the CCCCC with technical support from Acclimatise and funding from CDKN and DFID Caribbean. One priority challenge identified in the plan was the need to develop a risk management ethic in decision making in the Caribbean, ensuring the use of risk management processes and tools, management of uncertainties and integration of climate change into national development planning and decision making. CCORAL has been developed in response to this need. To download a copy of the CCORAL brochure, please click here. 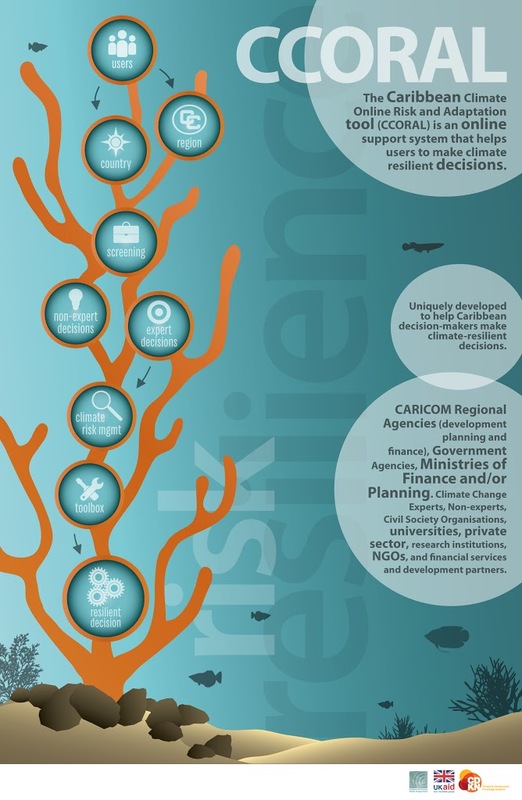 To download a copy of the CCORAL infographic please click here. To download a copy of the CCORAL factsheet please click here. To view the Caribbean Climate Online Risk and Adaptation TooL (CCORAL) please click here. By caribbeanclimate in News on November 29, 2013 .